What better way to get both an artistic and symbolic start to the walking tour than a visit to Angel City Brewery, with walls featuring work from both antigirl’s Heart of Los Angeles and JR’s Wrinkles of the City. 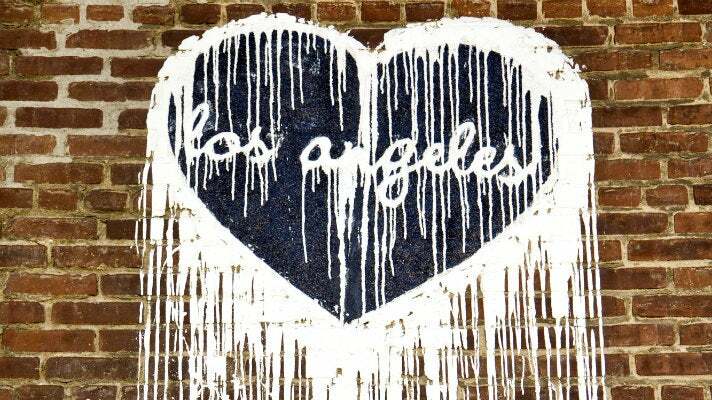 San Pedro-raised antigirl (aka Tiphanie Brooke) created the “Heart Los Angeles” symbol as an answer of sorts to the iconic “I♥NY” emblem Milton Glaser created in the 1970s. The “hearts” have become a signature of sorts around the city for antigirl, and are fast-becoming one of the most sought-after photo spots. 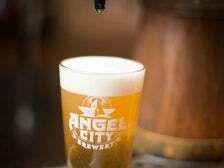 Angel City Brewery is about a block south of the Little Tokyo/Arts District station of the Metro Rail Gold Line. 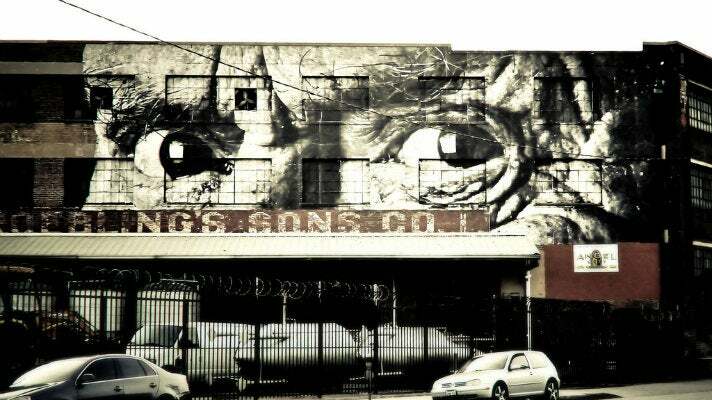 The brewery also features one of JR’s haunting The Wrinkles of the City portraits. 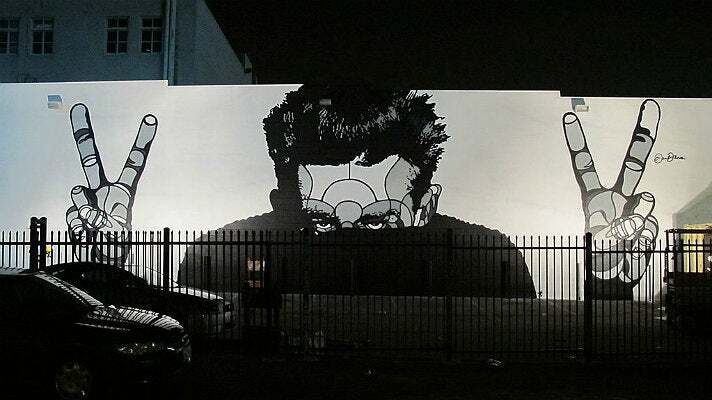 With featured street art in cities ranging from New York to Shanghai, Havana and Berlin, JR began painting his Los Angeles Wrinkles series locally in 2011 as a grittier, realistic counterpoint to the glossy, airbrushed images that are often synonymous with L.A. and its entertainment industry. 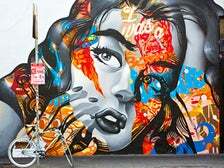 His insistence on creating street art allows him to boast about having “the biggest art gallery in the world,” and, in this case, Angel City Brewery serves as one of the larger walls of that gallery. 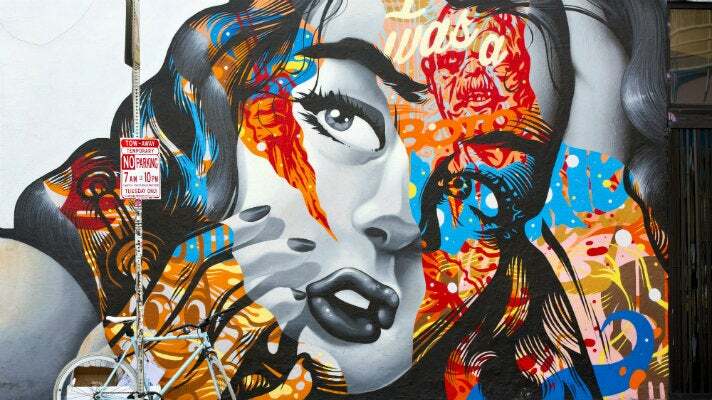 Los Angeles native Tristan Eaton began painting street murals as a teenager in the 1990s. Eaton has lived and painted in London, Detroit and Brooklyn - he moved back to L.A. in 2012 to pursue his paintings and large-scale murals full time. With a style influenced by comic books, skate culture and graffiti, Eaton’s work has been exhibited in galleries around the world and is in the permanent collection of New York’s Museum of Modern Art (MoMA). I Was a Botox Junkie, like JR’s Wrinkles, is another take on the image self-consciousness that pervades local culture. 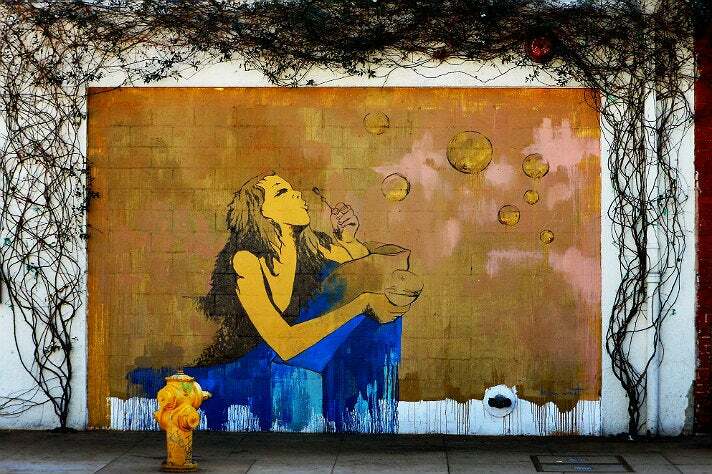 The colorful mural was painted in 2013 and is located a few steps west of The One with the Bubbles. From the Botox mural, head north on Traction, turn left on E. 3rd Street, and left on E. 4th Place to EightyTwo. On the exterior of the bustling bar and arcade, you’ll see an untitled collaborative piece by Vyal and RISK. 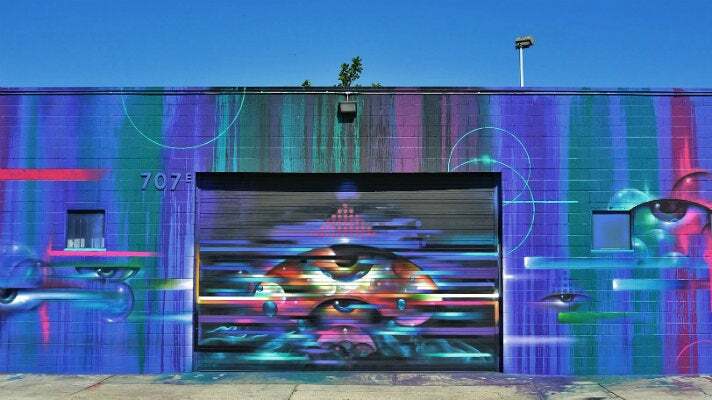 Vyal, aka Vyal One, is a native of East L.A. and is known for his dark, detailed style with its signature eyes and bubbles. RISK is a pioneering graffiti artist who was one of the first in Southern California to paint freight trains, and then took his art from the streets and into the gallery with his legendary series of Third Rail shows. A native of California, artist David Flores first gained notoriety with his designs for the skateboarding industry. Since then, his work has garnered international acclaim, ranging from his signature “Stained-Glass” murals of iconic figures, to limited edition vinyl toys, paintings and more. 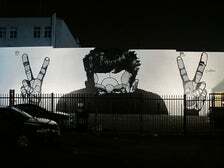 Based on a 1955 photo of James Dean by legendary photographer Phil Stern, Flores created a mural that playfully depicts Dean raising his hands like President Richard Nixon in a double “V” for victory sign. 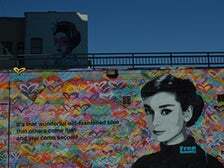 Street artist Free Humanity painted this 15x50-foot mural, It's that wonderful old fashioned idea that others come first and you come second, which depicts Audrey Hepburn in what appears to be a “field” of hearts. From Septerhed’s traffic box, head back to Los Angeles Street, make a right (south), then head four blocks down to the corner of Los Angeles and Winston Streets. The mural is on the side of a Subway location. The work of infamous British street artist Bansky is known for its subversive, dark humor and often biting political and social commentary. 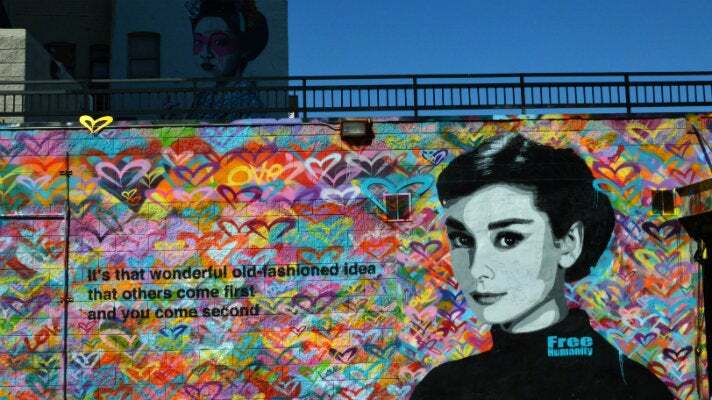 His distinctive stencilling technique has been showcased on city streets, walls and bridges around the world. 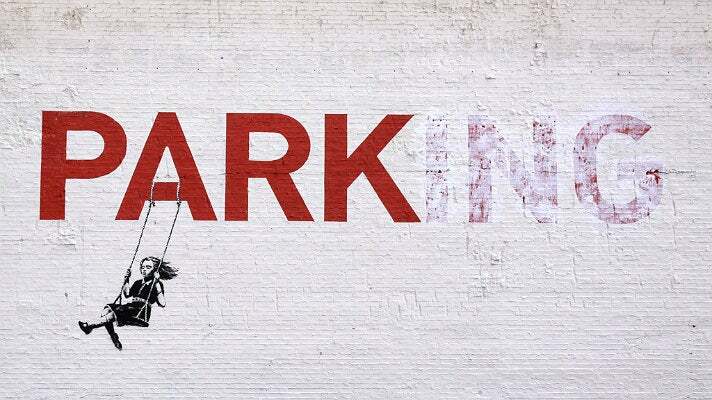 Banksy’s first film, Exit Through the Gift Shop debuted at the 2010 Sundance Film Festival and was nominated for Best Documentary at the 83rd Academy Awards. 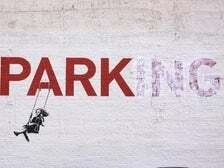 In April 2010, the film made its West Coast premiere at the Los Angeles Theatre in Downtown L.A. To coincide with the premiere, Banksy created several works across the city, including Parking outside The Sparkle Factory at 9th and Broadway. Located across the street from the Ace Hotel, the historic seven-story building opened as the home of L.L. Burns Western Costume Co. in 1914. The iconic scene from Safety Last! (1923), featuring Harold Lloyd dangling from a clock tower high above the street, was filmed on the roof of the L.L. Burns building.